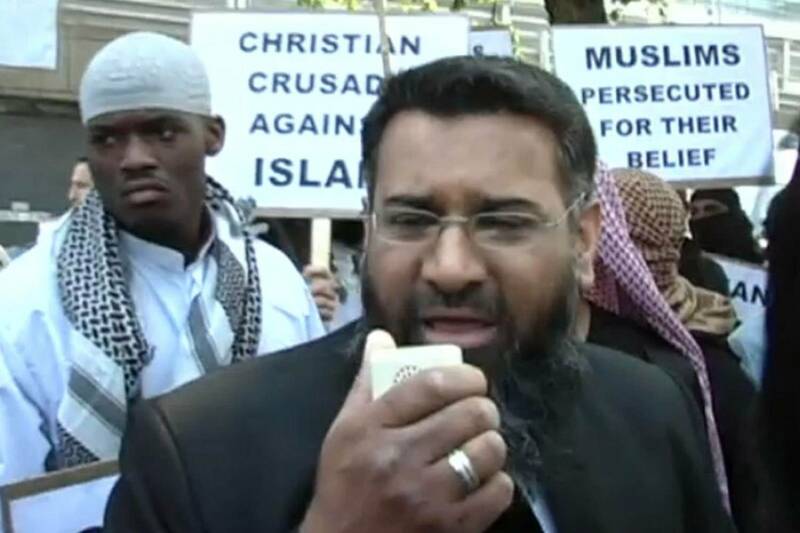 Anjem Choudary is seen here with Islamist killer Michael Adebolajo at a previous protest. Radical British Islamist Anjem Choudary was arrested today for supporting ISIS. He will remain in jail until late August. Radical preacher Anjem Choudary has appeared at Westminster Magistrates’ Court charged with inviting support for the so-called Islamic State. He and another man Mohammed Rahman, indicated they would plead not guilty. Anjem Choudary was remanded in custody until 28 August. Both men have each been charged with one offence under section 12 of the Terrorism Act 2000, alleged to have taken place between 29 June 2014 and 6 March this year. The judge replied to say he took that to mean he would be pleading not guilty. Mr Choudary 48, was described in court as a “high-profile figure” in the media and on social media. The court also heard that the charge is related to him sending messages to his 32,000 followers on Facebook. Anjem’s supporters hope he will continue his work in prison.